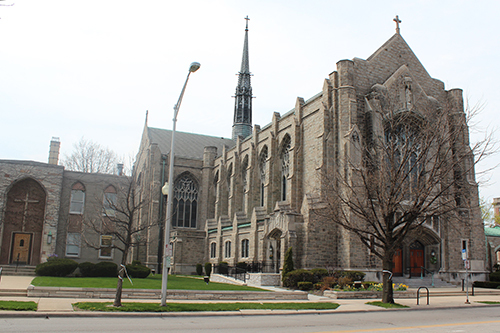 St. Catherine of Siena Parish was founded in 1889, and was the first Catholic parish established in Oak Park. In 1974, St. Catherine of Siena was merged with St. Lucy Parish of the Austin neighborhood Chicago's West Side (which had been founded in 1911), forming the renamed St. Catherine of Siena – St. Lucy Parish. We, the parishioners of St. Catherine of Siena-St. Lucy Parish, seek to deepen our relationship with God and to celebrate God's presence in Word and Sacrament. By accepting all into our family, we seek unity in Christ and seek to proclaim His Good News in the Discipleship of our lives. The parish has approximately 500 member households, blending the city and suburbs, drawing from the west side neighborhoods of Chicago, Oak Park, River Forest, and beyond. St. Catherine-St. Lucy is known for its diversity and welcoming parishioners from different backgrounds, including different ethnicities, socioeconomic levels, and sexual orientations, among other characteristics. For example, many people with mental disabilities are present in the congregation and some participate in the Mass as altar servers or lectors. An African-American Heritage Celebration is an annual event each February. The parish includes St. Catherine-St. Lucy School, which educates children from kindergarten through eighth grade. The school is supported in part by the Big Shoulders Fund.